I've been working with Michael Pilarski, Skeeter of Friends of the Trees http://www.friendsofthetrees.net/ , in North Central Washington to produce a series of videos about his work to create sustainable small farming projects. In this set of 12 videos Skeeter demonstrates his method to create a family agroforestry farm under 5 acres. These farms produce much food and some income for operator support. Most important it creates forested, sheltered, self reproducing ecosystem. Two of these videos, Sunny Pine and Whispering Pines illustrate examples 14 and 28 years old that are still producing annual food and medicinal products. Over this period these agroforestry projects have developed into vivid green oasis of cooling shade in this shrub steppe semi-desert ecosystem of his home in north central Washington. Making sustainable food/forest systems has been become a life long mission for this man. Skeeter is well known to many of us in the Northwestern USA as lecturer on permaculture and organizer of barter fairs and tree exchanges over the last 30 years. Here is a simple screening test comparing herbicide inactivation by Biochar and Activated Charcoal. This test can be used to screen the relative adsorbtive capacity of your home made biochar by testing with an easily obtained herbicide, Caseron. Upper right control set from right: activated charcoal, biochar, untreated. This test is with Caseron (dichlorobenil). Many other herbicides, pesticides are neutralized by activated charcoal. Use of activated charcoal is common accepted practice to clean up pesticide residues that result in poor performance via root development, germination, plant growth and vigor. Many herbicides such as Atrazine, Proamide, Amitrole and many others have either residual effect in soil or are transmitted in water. UC Riverside has nice tool for accessing leaching and runoff risk of chemicals as these here And as example here is profile for Atrazine, a widely used herbicide in corn production. Results in plant performance then obtained with biochar that has adsorbtion properties similar to activated charcoal may be better explained by deactivation of toxins and/or natural/introduced inhibitors. 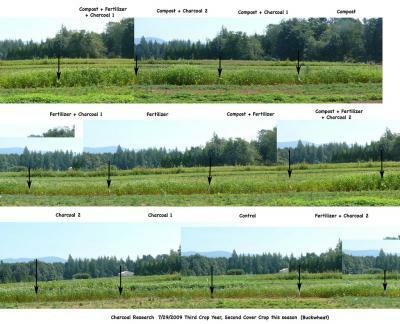 Conversely farmers using herbicides as part of their normal production cycle may lose efficiency of their chemical applications if used coincidental with biochar. Whether this property of biochar continues over time after active sites are filled up is not known to me and also whether these toxins are eventually degraded or released gradually in diluted form. This study predates the coining of the term biochar and I claim grandfather rights to use the word charcoal. Summer 2009 Biochar plot studyresults are showing some trends I have had difficulty measuring with the last two years of cropping these plots. The use of buckwheat, a short season cover crop plant makes a visual view of performance reflecting nutrition, quite vivid. In spite of the dips in the plots due to deer browse. Summer 2009 Biochar plot study results are showing some trends I have had difficulty measuring with the last two years of cropping these plots. The use of buckwheat, a short season cover crop plant makes a visual view of performance reflecting nutrition, quite vivid. In spite of the dips in the plots due to deer browse. charcoal 1 ( about 1/2 inch minus), charcoal 2 ( powder from John Flottvik's pyrolyser). After visiting Richard Haard and Larry Williams in early 2007 I started discussing the use of charcoal with various nursery growers and researchers in the West. 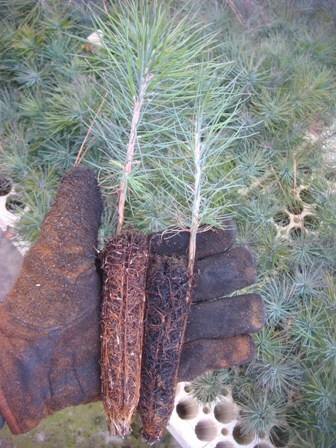 A commercial nursery in California became interested in substituting charcoal for vermiculite in a growing media - soilless substrate - for container grown tree seedlings. I have been looking at the data sets of the soil analysis we conducted on the plots on June 25, 2007 and October 30, 2007. The first soil samples were taken about a month after project setup and planting and the last was at the end of the growing season. I sampled with a hand held soil coring device, and took samples uniformly in each 17 foot long test bed. They were dried and screened to remove lumps and pieces of wood/charcoal etc. I just finished over the last few days organizing images and data from my charcoal experimental plots. I am presenting a new set of posters showing root systems of the native shrub, Lonicera involucrata or black twinberry that I used as an experimental subject in these treatment plots this summer. This will be the last of a series of piecemeal postings about my findings on the terrapreta reading list. In time, I will prepare a summary of what I have accomplished this year, the shortcomings, what I feel I have learned from this work about using charcoal and my plans for continuing this experiment for 2 or more growing seasons. Greetings As an extension of my conversation with Jim I am forwarding this farm in-house conversation on % Base saturation. Noteworthy is a interesting trend of higher Mg % saturation where I treated with charcoal powder 4 growing seasons ago. The following information from this Clemson University Soil scientist is a good way to get a working understanding of CEC and base exchange and how we might use it to manage soil nutrition here. WHAT IS THE USE FOR THE CATION EXCHANGE CAPACITY (CEC)AND THE PERCENT BASE SATURATION ON THE SOIL TEST REPORTS? It is interesting also as an indicator of functional activity of charcoal in soil higher CEC did not show up in our block tests this year. The literature however indicates there is a weathering process and combination with soil organic matter < in the tropics> that brings on this activity. Also Cornell researcher Janet Thies showed continued rinsing and incubation improve CEC of charcoal in soils. I submitted to Tom for posting [attached] some initial soil analysis data from my charcoal block study. In am just beginning to compile a report on this work. 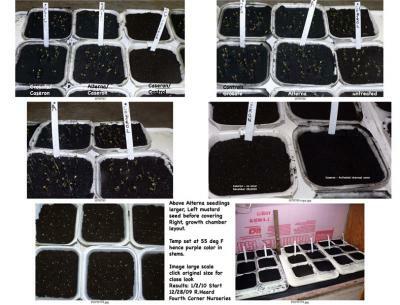 When it is posted you will see soil analysis results averaged for each replication(2) for 2 dates , April and October. Listed are pH, Buffer pH, OM, Nitrate, Cation Exchange Capacity (CEC) and base exchange components, % Potassium, % Magnesium, % Calcium. Other soil analysis was taken but not presented here.